Hyundai has always been known for having safe vehicles, but their latest goes above and beyond. 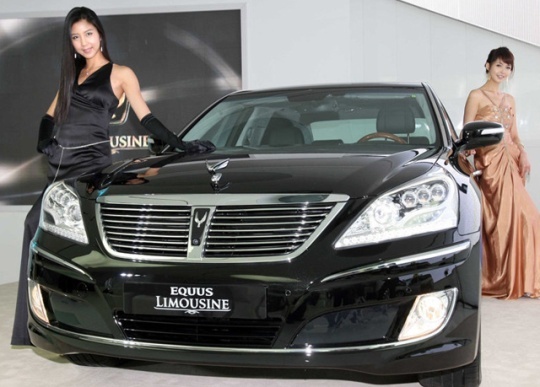 The South Korean automaker has introduced a revised version of its armored Equus Limousine in Korea recently. Most people outside of South Korea are probably unaware that the Equus is in fact an older vehicle. The car was actually in its second generation when it arrived in US showrooms. The first generation Equus flagship sedan was actually released in 1999 and was a joint effort of Hyundai and Mitsubishi. The Equus landed in the Korean market, with the Mitsubishi version, the Proudia, pretty much limited to Japan. A small number bearing the Hyundai badge did make it to China and the Middle East. There was also a limousine version released in the Korean market, as well as the poorly named Mitsubishi Dignity in Japan. The second generation was released in 2009, but bears little resemblance to the first, other than the name. Hyundai pretty much started making an armored version of the Equus immediately after this release, with the first armored Equus available in Korea more than a year before the regular model was released in the US. The very first armored Equus was donated to Cheong Wa Dae (the South Korean presiden’t residence) for use by the president. It was around this time that Hyundai was seriously exploring the idea of expanding its business globally, with the Equus finally arriving in the US in 2010. Hyundai recently took the opportunity to garner some good publicity by donating an armored Equus to UN Secretary General Ban Ki-Moon, who is also Korean. It’s standard procedure not to divulge the details of armored vehicles built for heads of state, which was a practice Hyundai followed for this one. There has been much talk about clandestine armoring work being done on Equuses in Germany, which isn’t surprising since Hyundai already produces standard armored vehichles in cooperation with German companies like Stoof-International Germany and Armortech Motors Group. It is possible for US residents to get their hands on an armored Equus, as a company called Alpine Armoring includes the car in their lineup. The standard armored Equus usually comes with VR7-level armoring, which can withstand up to 7.62mm rifle fire and an under the car explosion equivalent to 15kg of dynamite. It is believed the armored models weigh as much as 9,000 lbs, which is actually on a par with most armored vehicles of that size. It’s been a steady climb to success for the Equus since it was released in 1999, to the point where it is now fiercely competing with global luxury brands that are far more established. This is also a clear sign of just how well, not only the Equus has come, but also the entire Korean auto industry. A few short years ago, no-one would have believed that these cars would be competing against established luxury brands, or that Hyundai would be delivering armored cars to heads of state. The Hyundai Equus holds the distinction of being the first armored car built in Korea, but of current trends hold true, there is absolutely no reason to believe that it will be the last.